A throne-like desk chair and a sofa for fantasising on are among pieces launching as the second part of Ini Archibong's collection for furniture brand Sé. The 11 new additions, by the Nigerian-American designer who is based in Switzerland, complete the 22-piece collection, the first half of which was debuted last year. The second instalment will be showcased within the brand's usual spot at Spazio Rossana Orlandi during Milan design week, which takes place later this month. Its name, Below The Heavens, makes reference to Archibong's inspiration for both parts of the collection, which he said is "the eternal interplay between heaven and earth". While Part I focused more on celestial bodies and sky-gazing, Part II is inspired by terrestrial and monumental elements. "Here, I was particularly inspired by the monolithic shapes of standing stones," said Archibong. "The new part of the collection builds upon this theme." Described by the brand as statuesque and mature, Part II includes lighting, glassware, seating and tables and the pieces feature updated wood finishes as well as bespoke crystal colours. The streamlined Oshun Sofa is named after a Yoruba deity that acts as an intermediary between humankind and the spiritual, known as an Orisha – specifically the deity of love and pleasure. Upholstered in fabric and leather with a base made from brass, the sofa is designed to offer a "heavenly landing on earth". It's available with one or two back cushions as either a sofa or daybed. "It's a bit like a grounded cloud," Archibong told Dezeen. "I think of it as a seat for reposing, thinking and fantasising – a place for personal escape." The brand's existing Moirai chandelier is joined by a matching series of crystal glass lamps and vessels which are mouth-blown and hand-finished in Switzerland. For the new table and floor lamps, which feature brass stems and bases, the brand has developed new crystal colours that fade from coloured to clear glass across the full range of shades. Made from solid oak and inspired by standing stones, the throne-like Atlas desk chair is stained by hand. "Upholstered with a high headrest, back pad and seat, the Atlas Desk Chair has the look of a sentinel and a scale that gives the sitter a superb vantage point," explained Archibong. "This is a chair that offers a ringside seat on the world." Designed for use both indoors and outdoors, and available with or without arms, the Circe sofa is a playful take on Shaker style according to the London-based brand. Although the design originally launched last year, the brand has developed a new version that features interchangeable cushions allowing customers to play with colour combinations. "In the same family as the Lounge Chair, the Circe Sofa welcomes the spiritual traveller back to earth," said Archibong. "There is a hint of classicism and a touch of American design history in the Shaker-like vertical supports, providing roots for this futuristic design that incorporates three different upholstered areas." Also launched last year, the cantilevered Eos table is now available in solid oak with stains that have been hand-selected and in some cases developed exclusively for Sé. 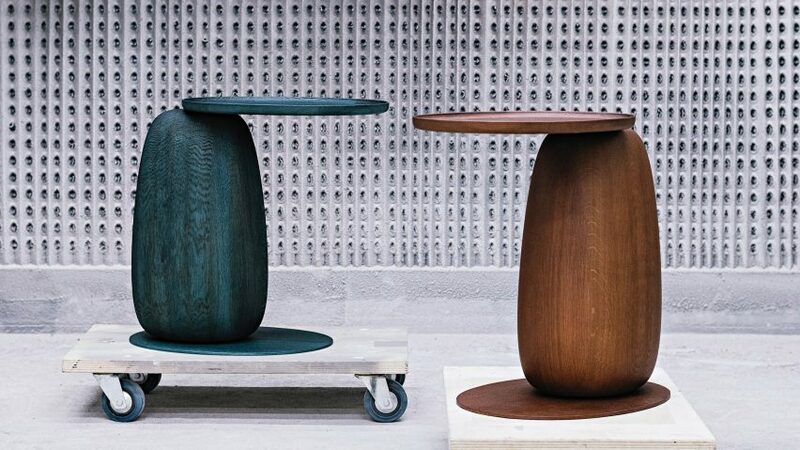 Other launches happening at Milan Design Week include an expansive homeware collection by Architect André Fu, furniture, lamps and jewellery by designers from Norway, which demonstrate sustainable design and the circular economy, and a permanent restaurant and showroom called The Manzoni by designer Tom Dixon. Ini Archibong's Below the Heavens collection for Sé is on show at Via Matteo Bandello 16, 20123 Milan from 9 to 14 April.